What about, ‘slow news day’? All this news about Tuft’s now accepting YouTube videos is a bit silly. Revolutionary? Hell no. Kids have been sending art portfolio’s, dvd’s, resume’s and add-on’s to their applications for years. 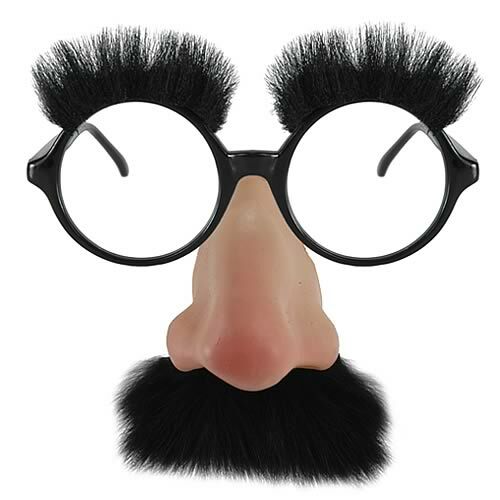 I remember one application from a kid who sent in some goofy glasses with the big nose and mustache. We wouldn’t encourage them to do it as Tuft’s apparently is now, but they sent it anyways. That doesn’t mean we looked at it. It’s fun, I’m sure the kids enjoyed it, but will it change college admissions. Umm no. Chill out people. Do the folks at Tufts really have time to watch over 1,000 YouTube videos? (BTW that’s less than 7% of their total apps.) I wonder…. As a marketing tool, I totally agree that it’s a fun little hook. But please stop with this “It’s going to revolutionize college admissions” crap. BTW if you google Tufts Youtube, this is what comes up first. Love it. I’ve got to eat some crow here. Turns out, I was totally off on that last post. What I didn’t notice was that each post to Twitter fed from a Facebook feed has redirects a user to Facebook. It looks lame and is totally bush league looking. My bad Rachel. You’re totally right. This somehow started out as a simple comment to Rachel Reuben’s recent blog post this morning and somehow ballooned into a 568 word blog post of my own. Rachel’s post essentially said that linking Facebook and Twitter updates is something to be avoided. Now, I think Rachel’s broader point is valid, original content on each channel is best, but I don’t agree with you that linking the Facebook and Twitter pages is bad idea. In fact, if we’re talking about fanpages for schools (personal pages, absolutely agree with Rachel. There’s already too much noise on both media, no need to increase it), I think it’s a great idea. I have the Groton School fanpage linked to the Twitter page so that Facebook updates (photos, events, wall posts by me, etc) are published to the Twitter account NOT vice versa. The Facebook page is updated once a day. Groton’s got 1,000 Facebook fans and 145 followers on Twitter (if you take out folks like jenna5443 who wants me to check out her naughty photos, probably more like 100). Let’s say I’m doing an alumni event in NYC. I create the event in Facebook and it posts to the wall. It also posts to the Twitter account. Now I could go ahead and create an event in Twivite, but my audience is only about 100 legitimate followers. In an NYC event, we may get 300 – 400 people. When I do an event, I want my audience to see that there a ton of people going to this event. They’re not going to see that if I create separate events on Twitter and on Facebook. I also contend that while it is the same content and I’m willing to bet that those 100 legit Twitter followers are also fans of Groton School on Facebook, how those two audiences access that content is completely different. I’m guessing that the Twitter user has Twitter open either on their laptop, BB or iPhone all day. I doubt that’s true with Facebook as many employers block it. I post damn good (it’s at least good, well maybe just okay) content to our Fanpage at least occasionally. That’s content that Twitter users might miss out on if I only posted it to Facebook. Somehow my linkage is one-way. I don’t know how I set it up that way, if I did it consciously, or if I just got lucky, but I thin that’s important to note. I do agree with you that Twitter is a more active medium and it’s a place where it’s okay for me to send updates of the score of the football game. Facebook is not an appropriate medium for that. That’s annoying. Now, the key is to be on both in order to respond. Yes, I may just be using Facebook to push content to Twitter, but I also have Tweetdeck open and I’m at the ready should anyone respond. To me, this really is just another tool, and like any other tool, you need to understand how to use it. I’m not willing to say that you absolutely should or shouldn’t, but, rather, it depends. *One other throw in here, people have been commenting that one major reason is the 140 character limit in Twitter. Are you publishing novels to your Facebook status? If you can’t say it in 140 or less, then don’t – Twitter, Facebook, doesn’t matter. Huge FB updates are obnoxious and difficult to read on my iPhone. DSCF7019, originally uploaded by drewmillikin. Sometimes I feel like I just upload photos to Flickr without looking at them. I came across this as I was looking for photos for a presentation. 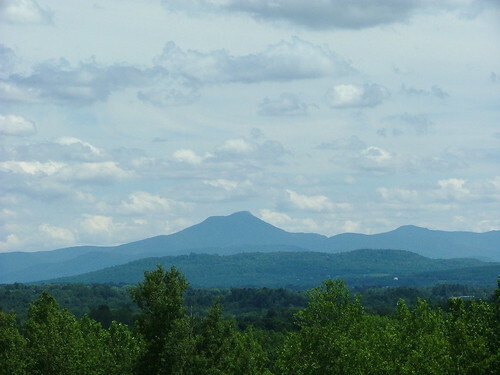 It’s the view of Camel’s Hump from across Rte 15 from Saint Michael’s. I took it as part of our Farewell Vermont tour just before we moved to Massachusetts.